Today’s HOT Amazon toy deals are listed below, don’t miss them! Have you began shopping for the kiddos yet? 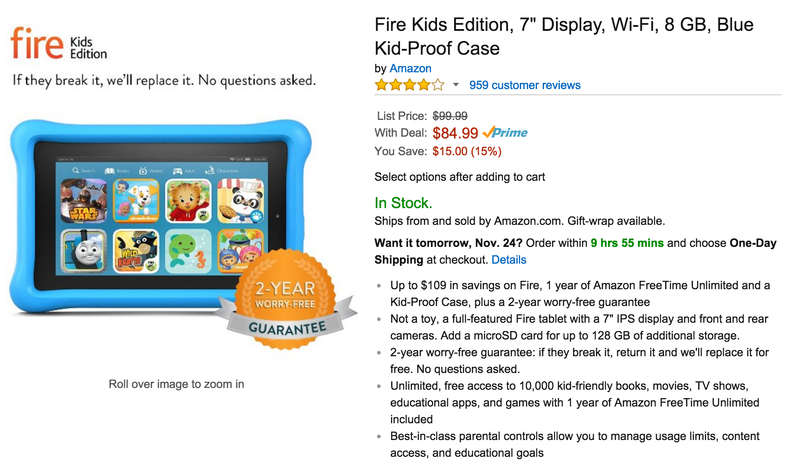 Well, it’s time to start because Amazon is having an incredible deal on their Kindle Fire Kids Edition for only $84.99! The Kindle Fire Kids Edition has an awesome case to protect the tablet and a tons of great apps. Amazon is also giving a two-year warranty with every one purchased. Hurry and get it this week before the price goes back up! Father’s Day Gift Idea: Stanley 65-Piece Homeowner’s Tool Kit only $39! Grab this Stanley 94-248 65-Piece Homeowner’s Tool Kit for only $39, which is almost 50% off the retail price on Amazon.com! This would make the perfect Father’s Day gift– all the basic tools needed all in one nifty little carrying case. You’re saving and helping your Dad organized with some manly tools.. I’d say it’s a win-win all around!